Details on Pattern Giveaway towards the bottom of the page..
Hello Everyone! Hope you guys are having a great week.. Mine is going great, so far, all I've done is work (daytime hustle) and I started cutting out patterns for my next project. So last month, I got an email from Kennis, a new independent pattern designer (digital PDF) and owner of Itch to Stitch. She wanted to know if I was interested in sewing and reviewing her newly released pattern, the Marbella Dress. She looked through my blog and thought Marbella Dress may be my style, she was right! At first glance at the pictures of the Marbella Dress, I knew that it's something that I'd love to wear and have in my closet. It's very classy and sophisticated and whatever fabric I choose to sew it would look great. I agreed to sew and reviewed the Marbella Dress and started thinking of inspiration. Should I use print or solid fabric? Should I use Ankara / Wax print fabric? Should I add another fabric or not? All these questions and more were going through my head.. Then all of the sudden I thought about the Carolina Herrera Cocktail Dress worn by Emily Thorne for the Revenge Season 4 Premiere (one of my fave shows).. The CH dress has a sold red yoke and floral bodice and skirt. It was a perfect inspiration for how I wanted my Marbella Dress to look like. Pattern Description: Wide boat neckline, Front and back yokes, Princess seam in the bodice, Tulip Skirt, and in-seam pockets. Did it look like the photo/drawing on the pattern envelope once you were done sewing with it? Yes it does. Were the instructions easy to follow? The instructions were very easy to follow. Kennis did a great job explaining each step. And the pictures makes sense. Likes: I love that there were instructions for a lined and unlined version. I chose the lined version because I'd love to keep this dress forever and in my opinion, lined dress/skirts/tops last longer than unlined. I also love that it has the in-seam pockets.. I was able to keep my phones in it and lip gloss.. I didn't have to reach into my purse every time I want to check instagram. lol Another thing I liked was the yoke, it gives the option to either use a different fabric (like I did) or use the same fabric as the bodice/skirt. And of course the tulip skirt was super cute.. I even took my hem in a couple of inches on the sides so that the tulip style could me more defined. Oh how can I forget.. The fact that you can just print out the sizes you need was perfect. I didn't have to print out all 54 pages of the PDF pattern. I only printed my size and I was good to go. Dislikes: My only dislike was when I printed out the pattern, there were no numbers on the printed pattern pages or anything that could have helped in putting each printed pages together. Not sure if this user error though. But all that printed out were the lines that outline each pattern piece. I'm used to printed pdf pattern that has numbers or boarder that help you know which pages goes with each other. But because I more of an advance sewer, I was able to put the pages together. A beginner sewer might not be able to figure that out yet. Fabric Used: I used Home Decor fabric from Joann's for the Bodice and Skirt. I wanted to try something different and it worked perfectly. The dress was a little heavy but it was wearable. 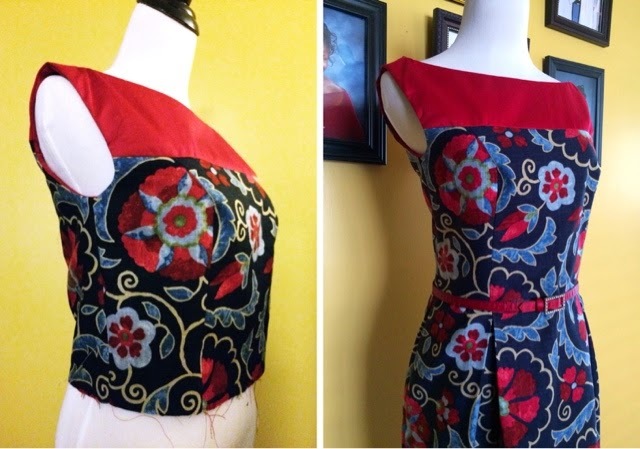 Pattern alterations or any design changes you made: At first I added an inch at the hem because I wanted it to be below knew length, but while doing the fitting, I realized that it was too long so I took off the inch I added. The only changes I made was to use the primary fabric I used for the dress, for my pockets.. I wanted my pockets to have the same fabric as my dress. 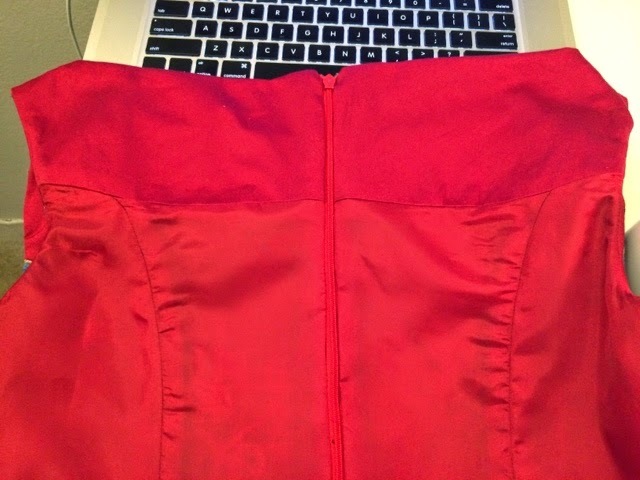 The instructions asked that you cut out 2 pocket pattern pieces using your primary fabric and then 2 using your lining. I didn't want my lining in my pocket. Also, I graded in one inch on each side at the hem. This was a proud moment for me. This is the inside of the dress, the back. I was so excited to see the seam line between the yoke and back bodice match. It's sometimes difficult to match them after you install the zipper. I'm loving your use of home dec fabric. It gives the dress such a nice structured look. Great work! I love how the pattern has curves which in my opinion adds and to and exaggerates your shape. I like the contrast between the pink and the blues in the fabric- they complement eachother and makes the patterns stands out more. Overall I'd easily wear this, it's very beautiful. Thank you! I'll look into doing that. I love the dress on YOU! Definetely consistent with your style. And the inverted pleats are so cute! The bodice in this dress is my favorite! I love the fabric selection and the shape of it. It's classy and always a go to piece when making a simple dress. This style would look great with just about any print..I love it! I like the home decor fabric...that is beautiful...it made such a beautiful dress. The inside of the dress?? ?Oh la laa...that is so professional. Overall! Beautiful dress. I like the figure enhancing style. In other words - it's not a sack! Very pretty dress. You did a great job. Thanks for the sweet giveaway. Definitely not a sack. :) Thank you, Jan! I think you did a great job! I love that you used home decor fabric, beautiful choice. Hi Chidi! Thank you! Yes, you can definitely mix sizes. You can print whatever size you need for the bodice and a different size for the skirt. The contrast between the yoke and the bodice is eye-catching! Love your fabric choices! There are a few things to like about this Pattern, the first and most important for me would be the A/B/C/D cups. Secondly, I like that it has Lined and unlined options. A lot of the fabric I come across seems thin and for me the lining is another layer of comfort. Pockets are always a plus and I feel the wide boat neckline that dips a bit lower than the traditional boat neck will compliment my inverted triangle body shape. Excellent! Being able to choose your cup size was perfect. Definitely a great pattern. I love it! The dress is lovely, and so form fitting! You did such a great job matching the seam. I have that problem a lot too! It just shifts on me after adding the zipper! P.s.s. : I LOVE your new blog template!!! Did you do it yourself? It looks awesome! I'm still searching for one that works for me... Do share! Thanks Chinelo! Lol you understand my excitement..
Yep! Good thing you stopped by.. :D I paid Jenell, www.thebrwnfox.com, to do my website. She's amazing. I love how flattering this shape is! It hugs all the righ curves. I just gave birth and this would fit my new curves just right! Sewing is my new hobby and this paytern would be so much fun. By the way I love the neckline and the fabric you chose. It pops but is still very sophisticated. I love love love! I really the pleated detail of the skirt part plus I am a sucker for any pattern with pockets. Incorporating your inspiration from Emily Thorne's dress is genius! It turned out really great and I am so going to try using that dress as an inspiration for a future project as well. Thank you, Raliat! Can't wait to see it. Hope you're having a great weekend as well. Thank you, Mitali!! CH is such a great designer. I'm too late for the giveaway, but love your dress! I really like how you used colour blocking and also the longer length of the skirt (I hate my knees!) helped me visualise what it would look like.